The Fischbowl: Twitter Lists & Aggregated Content: Are We Responsible? Twitter Lists & Aggregated Content: Are We Responsible? I was part of an interesting discussion on Twitter Friday night and I wanted to share it here, as well as add a few final thoughts. Participants that I reference are Bud Hunt, Brian Crosby, Dean Shareski, Anne Van Meter, Barbara Barreda, and Karen Fasimpaur. Thanks to all of you for helping me think through these ideas. The discussion started with a tweet from Bud Hunt where he shared some of what his school district is doing with Twitter. Here’s part of the tweet trail (I’m sure there were comments from other folks as well, but these are the ones I remembered and grabbed). I just want to add a few concluding thoughts. First, full disclosure, Bud called me on his way home from work and we talked for a while about this. Second, I wasn’t arguing against what Bud’s district is doing. In fact, I really, really like what they’re doing, I was just trying to explore the ramifications and think through some of the issues. @kfasimpaur It’s not so much the linking that I see as the problem. It’s the creation and the encouragement. 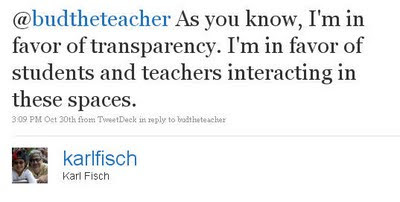 By creating the Twitter list, @budtheteacher’s district has created something *new*, not just linked to something. And when they publicize it & encourage folks both to add themselves to the list & to follow, that also blurs the lines. So, say a student in Bud’s district joins the Twitter list. Then he tweets that he’s . . .
. . . planning on hurting himself or others. Is there some kind of monitoring in place? . . .
. . . Should there be? Or say he tweets something offensive, then what? The fact the district has a disclaimer http://blogs.stvrain.k12.co.us/twitter/opt-in/ that they . . .
. . . “reserve the right to determine the membership of the SVVSD’s Twitter Lists” implies some ownership . . .
. . . and that some quasi-monitoring might be going on. So, again, I support what his district is doing and love the transparency and the community. But I do think it’s really complicated and there are many things we still need to think through. Now, I actually might have tweeted something different because there probably would’ve been some replies in there that would have altered my thinking, but you get the idea. Transparency and community building by teachers, schools and districts is something I very much support, and I think what St. Vrain is doing is very compelling and very interesting, but I also think it’s uncharted territory and there are some pretty complicated issues involved. This is a really important conversation to have, so I’d love to hear your thoughts on this. As retiring as I tend to be, I agree with @budtheteacher that the kindergarten model of all of us sharing would be the ideal toward which we all work. I love the idea that I need to model, I hope the fact that I struggle to participate (even though I firmly believe in the worth of the network) makes students feel like they can struggle as well. Something I think might add to this conversation is this: "it is apparent that the more students are involved in the social and intellectual life of a [school], the more frequently they make contact with faculty and other students about learning issues, especially outside the class, the more students are likely to learn" from http://www.ccsse.org/aboutccsse/engage.cfm , though I've read similar elsewhere. So, to extend, the more students participate in the online community, the more frequently they stay in contact with each other and their teachers (mentors?) the better they will do in school. So, if lists and posts and tweets need to be monitored, it may be a very worthwhile use of our time, if we can engage students as part of our learning communities. I struggle with the idea of an organization aggregating streams of information posted by its members (staff and students,in this case) not from the perspective of being responsible, while that is one consideration but more from the point of value. Twitter, for most people contains the blurring of personal and professional more than most publishing spaces. 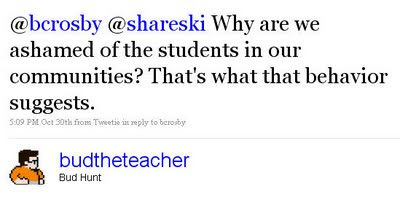 I don't display my twitter stream on my blog because, for the most part my blog is my professional learning space. I will tend to get visitors to my blog who don't understand twitter and should they see me tweeted about the silliness with which I"m prone to natter about, may, from their perspective make me less credible. It's one very small way in which I try and separate personal and professional but I realize that may be a useless effort. All that to say, twitter may not be the best way to showcase or display organizational efforts. Most personal blogs have some disclaimer which states, "the view here don't necessarily reflect that of my employer". Publishing them outside the servers of the institution is intentional. It's not that we're ashamed of our work, it's just saying this is my space and it may or may not fully align or relate to the work I do for my organization. I understand the idea of wanting to use aggregation to share, celebrate or acknowledge the ideas and efforts of all members of an organization, I just see lots of issues with this. We're asking a lot of constituents to sort through the fluff and silliness from the substance. I don't think most tax payers are ready for that. I think the bluing of personal and professional is a key issue here. On one hand a twitter list should not be any different than a blog list from a school perspective. So I am with Bud here one thing leads to another and we are back to closing things down. On the other hand when I first started on twitter I used it mostly in a light hearted manner to stay connected with folks. Lately however I see it as a very valuable resource for learning, professional connections and pd. This also means I am more aware of what I twitter and use dm for other things. So are we teaching our students about being professional learners in professional spaces? I agree there are potential pitfalls but I am not sure they are any greater than they are in other ways we encourage an online presence. @Barbara - But blog lists are typically lists of blogs students/teachers created for school purposes, not personal blogs. Twitter, by nature, tends to be personal (I know you could have students create school Twitter accounts, but that's not what St. Vrain is doing, at least at the moment). That's a big part of why I think this is different. Again, not saying it's bad, but I think we need to examine this more closely. @Anne - I agree that the more we can get them involved in our learning network, the better it is. And that's why I like what St. Vrain is trying. But - for all the reasons I identified above - I still think we need to look at this more closely. @Dean - I agree, but since these are Twitter Lists, don't you think the folks that follow them are likely to understand to a certain extent how Twitter is different? Just like our students can adapt their language between IM and formal writing, do you think folks can adapt their expectations between school-related blogs and Twitter accounts? I can't help but think that this conversation also applies to other online communities, like Facebook. In my district, Facebook is blocked by our filter, and yet we have a Facebook group centered around supporting the district that was created by a department director which anyone can join. Does this FB group fall under the same considerations as a Twitter list, or are there enough differences between the two community/conversation/collaboration tools? That does make more sense, in the same way if I create a list of personal blogs and share them internally. I guess it's the location and endorsement of how this plays out. If it were me, I'd either request the info via email or some other space disassociated with the district for reasons described in my original comment. I find the idea of a separate personal and professional life interesting. I don't have a separation, as Popeye said, "I yam what I yam!" This really is probably the biggest reason I feel I can be completely transparent. Maybe because I live in the small town I grew up in and have such a history with my town and my school I feel more comfortable with my ability to not separate myself. My students are the children of people I grew up with. Think of a modern day Mayberry. This is the way I want to live, as a teacher, church youth leader, and family friend. I want to have relationships with both my students and their parents and I want both to feel comfortable communicating with me. I bring this ideal to my classroom and also to the internet. I can see that others have differing opinions and I realize their backgrounds and experiences do not match mine, but honestly I feel a sadness for them because of it. So my vote goes to open up flood gates and let the students in. I think it is something that we will not have an easy answer to, but the answer may have to evolve over time (by way of creating a more safe twitter environment for student and/ or more professional purposes?). Doesn't the aggregation argument come up in any user-contributed resource? If the division, or school, or even state/province Dept. 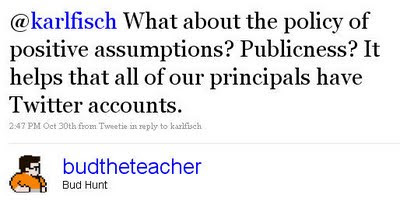 solicits contributions from teachers, principals and others, does that make them responsible for the content? I built a set of Pipes aggregators for my school, using Delicious & Diigo tags to list links that everyone thinks are valuable. While most of the shared tags are subject-specific, there is a "random" one that people use for articles they think their colleagues would be interested in. Am I, or is the school, responsible for content that gets tagged through this list? I would hope not. My personal inclination is that each user is responsible for their own generated content, particularly when it can be identified as theirs.